Les Ambassadeurs launch a series of recordings devoted to the repertory of the Dresdner Hofkapelle at the time of Bach, with the aim of rediscovering the splendid sound of an ensemble then regarded as the orchestral ideal. The ties of friendship between Johann Georg Pisendel – who led the orchestra – and Antonio Vivaldi held firm for life. 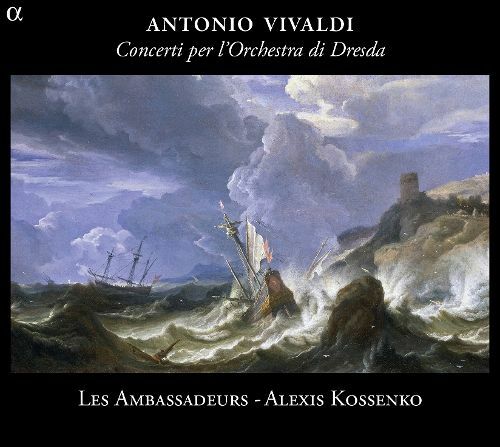 Between their first meeting in Venice in 1716 and the death of the Prete Rosso in 1741, Pisendel continually enriched his collection of Vivaldi concertos, a certain number of which were manifestly tailor-made for his outstanding technique and equally exceptional delicacy of expression. This explains why Dresden holds so many Vivaldian treasures, sometimes autograph, sometimes copied in Pisendel’s own hand. Although the concertos assembled by Les Ambassadeurs bear no explicit dedication, there can be little doubt that they were expressly written for the Dresden orchestra: they feature the instrumentation typical of the court Kapelle, with its horns and oboes vying for prominence with the violin. "any potential complaint of tonal monotony is vanquished by Les Ambassadeurs' fabulous playing. The exuberant horns of Anneke Scott and Joseph Walters thrill in quick outer movements"
"The performances by Les Ambassadeurs are admirable. The players show impressive technical skills. Zefira Valova delivers brilliant interpretations of the solo violin parts. She plays with modesty as she realises that she is not the star of the show and has to share the role of soloist with others. The players of the natural horns deserve special mention as they greatly contribute to this highly compelling recording. Older PostCD Reviews: Préludes, Caprices, Fantaisies - Concerts Cachés, Anneke Scott (horn). Resonus Classics, 2012.